It's no secret that animals, just like humans, can get bored without a little stimulation -- but this holds especially true for goats. Numerous studies have found that goats kept in captivity without proper enrichment opportunities are less happy and healthy than those given the chance satisfy their insatiable desire to run, jump, climb and just have a good time. In fact, having fun is in their nature. 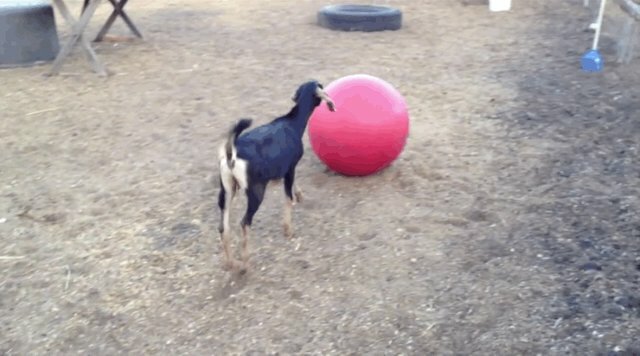 "Somewhere in the evolutionary development of Capra hircus [domestic goats], curiosity and play drive emerged as positive force for survival," writes Dr. Sara Savage, in a guideline on goat enrichment. "A healthy goat is an active goat. It is important to provide ample opportunity for exercise." Harkening back to their days scaling rocky cliff-sides in the wild, domesticated goats seem to take particular pleasure in climbing and balancing on virtually any object presented to them. So with that in mind, folks who care for goats, both as pets and livestock, have gone to great lengths to keep their animals entertained. 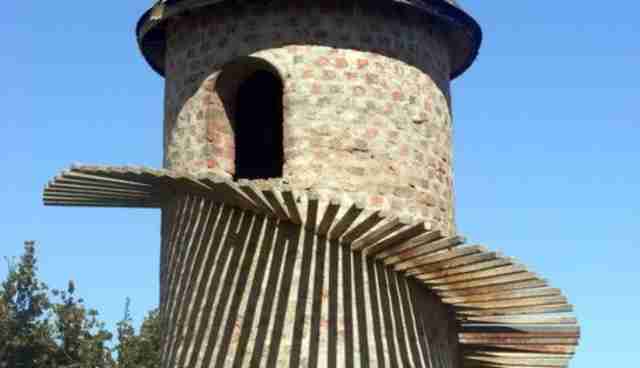 Perhaps the most elaborate constructions dedicated to goats' amusement are "goat towers" -- spiraling turrets that allow goats to explore their love of heights. David Johnson, a dairy farmer from Illinois, built a 31-foot-tall structure he created for his 34 Saanen milk goats to play on, said to be one of only three towers on the planet made especially for goats. "Goats love it and people driving by can't believe it," says Johnson to Farm Show magazine. "Goats are the most curious animals in the world so they use the tower a lot. They come and go, passing each other on the ramp as needed." But for goat owners who aren't skilled in medieval-architecture, less lofty constructions can keep the animals happy just the same. A simple round of elevated wooden planks seem to provide more than enough entertainment for this herd of baby goats, honing their running and jumping skills at the Caprine Enrichment Center in Oregon. Sometimes, even playground sets designed with a different type of "kid" in mind can be a source of amusement for the animals, like this goat enjoying a children's slide, and these others having fun on teeter-totters. Solid structures are one thing, but for goats who have already perfected their climbing skills, a more wobbly-type surface offers what looks to be an exciting new challenge. Here, a group of goats practice trying to stay balanced atop a thin metal sheet. Of course, climbing on stuff isn't the only way that goats have a good time. The highly inquisitive animals seem eager to explore the fun potential of any object placed in front of them, like this exercise ball. Even an old wheelbarrow seems endlessly amusing to a goat. In the end, all the efforts keepers make to ensure their goats are happy is more than just a nicety -- it's fulfilling a fundamental instinct not merely to stay alive, but to have a good time doing it.